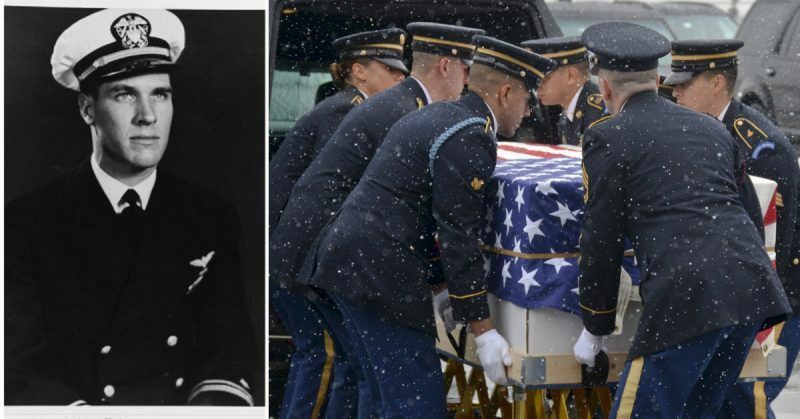 A Medal of Honor recipient from Concord, Mass., and former commissioner of the Commonwealth of Massachusetts Department of Veterans’ Services will be interred with full military honors at Arlington National Cemetery on April 4. Navy Capt. Thomas J. Hudner, Jr., a naval aviator who passed away Nov. 13, 2017, earned the Medal of Honor for his actions in the Battle of the Chosin Reservoir during the Korean War. After seeing fellow-aviator Jesse L. Brown of Hattiesburg, Miss. crash in enemy territory and become trapped in his plane, Hudner crash landed his own plane near Brown’s in order to render personal assistance. 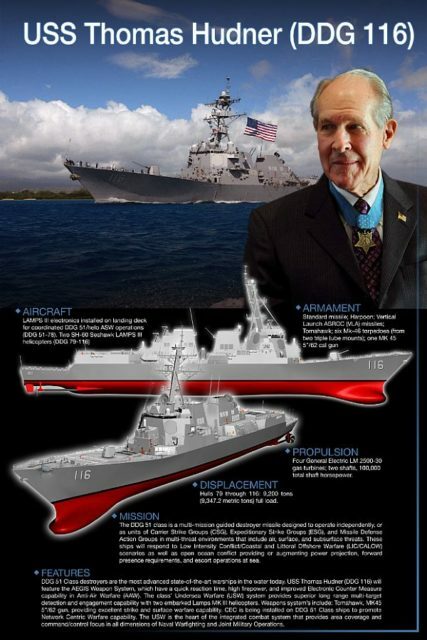 Hudner is also the namesake of a U.S. Navy guided-missile destroyer of the future USS Thomas Hudner (DDG 116) being built in Maine. During the ceremony, Strike Fighter Squadron 32 (VF-32), based at Oceana Naval Air Station in Virginia Beach, will perform the missing man formation flyover. VF-32 is the squadron Hudner flew with at the time he earned the Medal of Honor. 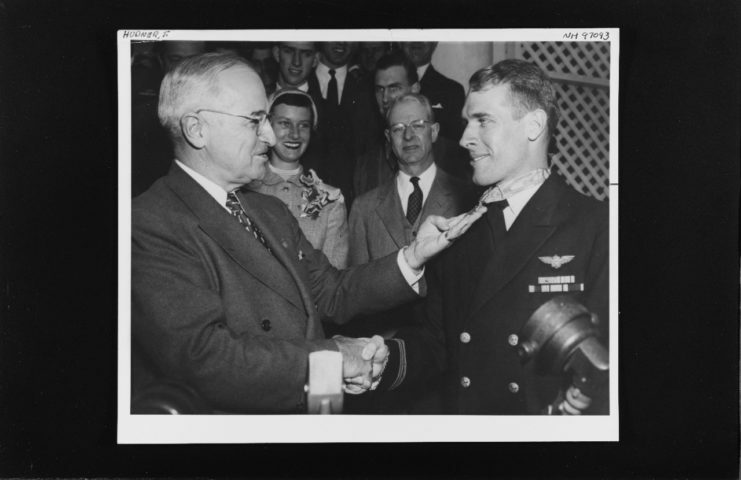 Believed by many to be a man who embodied the ethos of the United States Navy, Hudner was accepted into the Naval Academy in 1943, commissioned as an officer in 1946, and became an aviation officer in 1949. On Dec. 4, 1950, Hudner and his squadron were providing air support to American troops during the battle of the Chosin Reservoir. One of Hudner’s squadron mates, Ensign Jesse L. Brown, the first African- American to be trained as a naval aviator, was shot down by enemy anti-aircraft fire. Hudner saw that Brown was still alive in the wreckage and, fearing that if he didn’t land, Brown would succumb to his wounds or suffer at the hands of the enemy. In an effort to render aid to a fellow aviator, Hudner crash-landed his own aircraft near Brown’s downed plane. Receives congratulations from President Harry S. Truman, after he was presented with the Medal of Honor in ceremonies at the White House, Washington, D.C. Photograph is dated 13 April 1951. Official U.S. Navy Photograph, from the collections of the Naval History and Heritage Command. As soon as Hudner dropped his flaps and made his wheels up hard landing, he quickly made his way to Brown. Hudner’s attempts to pull Brown out of the wreckage revealed Brown’s right leg was crushed under the damaged instrument panel. While Brown drifted in and out of consciousness, Hudner kept trying to free his fellow aviator, all the while packing snow into the still-smoking engine. By the time a U.S. helicopter arrived to help, Brown was unconscious. For almost 45 minutes, Hudner and the helicopter pilot used an ax to hack away at the damaged plane but they could not free Brown. Even a plan to amputate the leg with a knife wouldn’t work because they had no firm footing due to the snow. As nightfall approached with the corresponding drop in temperature, Hudner and the helicopter pilot reached a grim decision to leave Brown behind since the pilot would be unable to fly in the dark. Brown was already near death and died shortly afterward. Hudner’s attempt to save Brown came just two years after the Navy had desegregated. 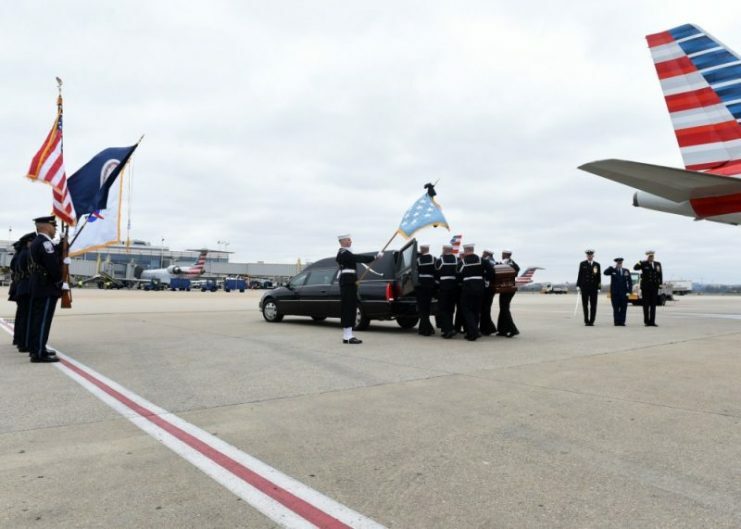 For the rest of his life, Hudner claimed that the reason he landed to save Brown was because Brown, like all service members, would have done the same for him. On April 13, 1951, Thomas J. Hudner, Jr., received the Medal of Honor for his actions at the Chosin Reservoir. He served 27 years in the Navy.